Mary Augusta Thomas, Deputy Director of the Smithsonian Institution Libraries (there are 20 of them), presented her views on technology and libraries in her keynote talk on the third (and final) day of Computers in Libraries. Given the Smithsonian’s preservation mandate, it was unsurprising for Thomas to say that knowing our history is important. Managing the past helps us plan strategically for the future. At the Smithsonian, new research methods, new discoveries (even new species), and new technologies change how people work. However, they still rely on the library for information. The library has moved into data curation and open access, for example, and will be creating profiles for Smithsonian researchers. The Smithsonian continues its international exchange programs, although most is now done digitally. Future librarians, according to Thomas, will have highly developed skills to collaborate and cooperate. In the future, you may not know your users. Librarians need to learn how to tap into their community. Collaboration is crucial to this, as is knowledge management. As library print collections move from books on shelves to special collections, library strategies much evolve. The act of discovery will not be dependent upon printed books. 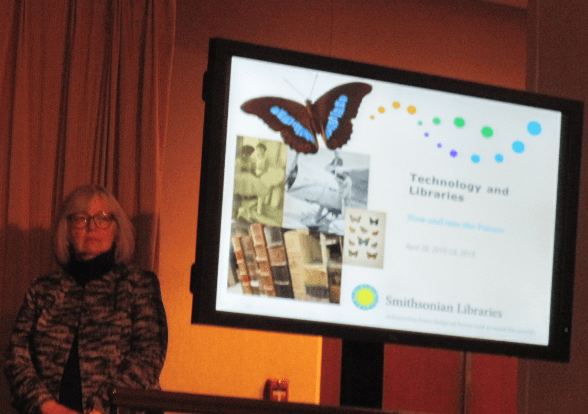 Technology will be important as libraries move into the future, as it has always been. Library as place will change as librarians give up ownership in favor of access. What happens to library? A quiet place to do research? An information commons? A person going around with a backpack? Community space? Whatever future libraries look like, what remains constant is the desire of librarians to want to be better than we are now. We want to be engaged with users and have our collections to relevant to their needs.